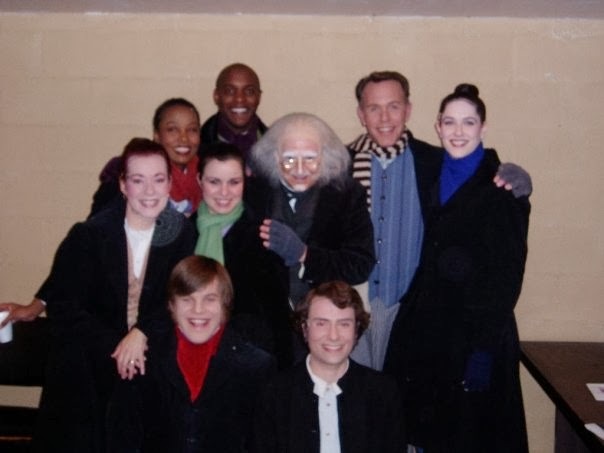 I've been in five different productions of Charles Dickens' A CHRISTMAS CAROL since arriving in America in 1992, excluding my own solo presentation which is in its fifth manifestation. Each has its own special qualities and memories. "Mr. Bob Marley's house. Mr. Bob Marley's wife, Mrs. Bob Marley." 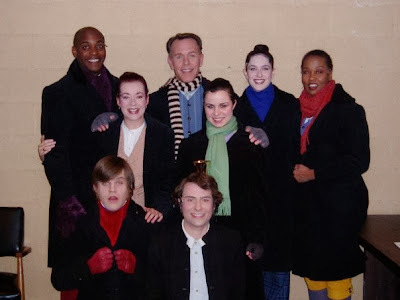 Since my line, as I zipped on stage immediately afterward, carrying plates, and curtseying to the audience was, "Belinda Cratchit" -- I didn't know whether to say, "Belinda Marley" to support my stage mother, or keep my line as it was supposed to be. If I said Cratchit, it would point out Carla's slip of the tongue, but if I said Marley, we'd have to change that familiar family name for the rest of the play. So I curtseyed and said, "Belinda Cratchit." No sooner had I uttered the words than Carla's eyes widened with horror as she continued, "Her daughter..." By this time, all the other actors were coming on stage and taking their place in the scene. We could barely hold it together! Like the professional actors we were, we channeled that hilarity into the moment. It was the liveliest, merriest, unashamedly entertaining Cratchit scene in the history of the play -- at least for the actors. Fingers crossed it translated to the audience!